Get some cultural insight at Doges' Palace and Cannaregio. Popular historic sites such as St. Mark's Square and Basilica di Santa Maria della Salute are in your itinerary. You'll find plenty of places to visit near Venice: Padua (Scrovegni Chapel, Battistero del Duomo, & more) and Passeggiata lungo la restera (in Treviso). Next up on the itinerary: explore the activities along Canal Grande, admire the striking features of St Mark's Campanile, snap pictures at Ponte di Rialto, and make a trip to Basilica di San Marco. To see traveler tips, photos, reviews, and other tourist information, read Venice travel itinerary planner. New York City, USA to Venice is an approximately 17.5-hour flight. Traveling from New York City to Venice, you'll lose 6 hours due to the time zone difference. In July, daily temperatures in Venice can reach 83°F, while at night they dip to 68°F. 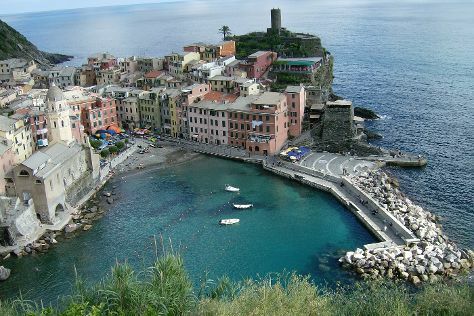 Cap off your sightseeing on the 10th (Mon) early enough to go by car to Cinque Terre. Deepen your sense of the past at sights like Centro Storico del Paese di Tellaro and Castello Malaspina. You'll explore the less-touristy side of things at Footpath Monterosso - Vernazza and Spiaggia di Fegina. Venture out of the city with trips to Isola Palmaria (in Porto Venere), Punta Corvo (in Ameglia) and Bagno Maurizio (in Viareggio). There's more to do: take in the architecture and atmosphere at Convento dei Cappuccini e Chiesa di San Francesco. To find maps, ratings, and other tourist information, read our Cinque Terre itinerary maker. You can drive from Venice to Cinque Terre in 4 hours. Other options are to take a train; or do a combination of flight and train. In July, plan for daily highs up to 81°F, and evening lows to 68°F. Finish up your sightseeing early on the 13th (Thu) so you can go by car to Turin. Start off your visit on the 13th (Thu): take a stroll through Via Roma, hike along Colline di Torino, then steep yourself in history at Duomo di Torino e Cappella della Sacra Sindone, and finally step into the grandiose world of Castello e Parco di Masino. Keep things going the next day: take in the spiritual surroundings of Basilica di Superga, contemplate the long history of Villa della Regina, then make a trip to La Venaria Reale, then take in the architecture and atmosphere at Santuario Basilica Maria Ausiliatrice, and finally take a stroll through Quadrilatero Romano. For maps, where to stay, ratings, and tourist information, read our Turin itinerary maker. Getting from Cinque Terre to Turin by car takes about 3.5 hours. Other options: take a train; or take a bus. In July, daytime highs in Turin are 84°F, while nighttime lows are 71°F. Cap off your sightseeing on the 15th (Sat) early enough to travel to Rome. Get some cultural insight at Palatine Hill and Vatican Museums. Piazza Navona and St. Peter's Basilica will appeal to history buffs. Explore Rome's surroundings by going to Ostia Antica (in Ostia Antica), Villa d'Este (in Tivoli) and Giardino di Ninfa (in Cisterna di Latina). There's still lots to do: contemplate the long history of Colosseum, explore the world behind art at Borghese Gallery, awaken your taste buds at some of the top wineries in the area, and take in the architecture and atmosphere at St. Clement Basilica. 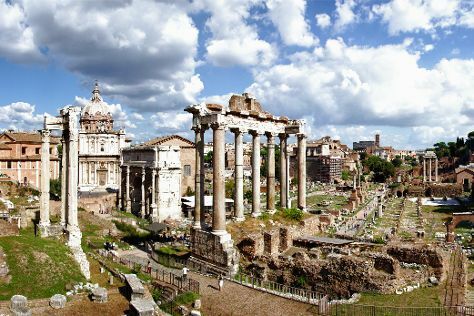 For photos, other places to visit, traveler tips, and other tourist information, use the Rome online itinerary creator. Traveling by combination of train and flight from Turin to Rome takes 4 hours. Alternatively, you can take a train; or drive. In July in Rome, expect temperatures between 88°F during the day and 69°F at night. Wrap up your sightseeing by early afternoon on the 20th (Thu) to allow enough time to travel back home.